Gold Bond is new investment option for India. The recent draft guideline for the sovereign gold bond scheme is notified by the finance ministry on 18th June 2015. This scheme will be launched to reduce the demand of physical gold. Sovereign Gold Bond will carry a fixed rate of interest and will mature in five to six years. This bond will be redeemable in cash as per the face value of the gold. Sovereign Gold Bonds will be issued on payment of money and would be linked to the price of gold. The gold bond would be limited to Indian residents. NRI will not able to invest in this bond. Restriction will be placed on the purchase of this gold bond at the suitable level, not more than 500 grams per person per year. The bonds will be issued in denominations of 2, 5, 10 grams of gold. The tentative interest rate payable on this gold bond will be in the range of 2-3%. This rate will be linked to the international rate of gold borrowing. The rate of interest on the bonds will be payable in terms of grams of gold. The price of gold may be taken from Bullion Market Association, NCDEX or from RBI and Rupee equivalent amount may be converted at reference rate of RBI for issue and redemption of gold bonds. Banks/NBFCs/Post Offices may collect money / redeem bonds on behalf of the government. Bond maturity period will be 5-7 years so that it will protect an investor from medium term volatility in gold price. Bonds can be easily sold, traded on commodity exchanges. Bonds to have a sovereign guarantee. A capital gain tax will be same as that of physical gold. This bond will be marketed through post offices and by various brokers/agents who may need to be paid a commission. Let us say you invest in 5 gm of gold bond with tenure of 5 years. If we consider per gram price is Rs 2500 your investment would be Rs 12500. You will be paid 2% interest per annum in terms of grams of gold. Total Interest on 5 gm gold after 5 years will be 0.52 gm (Compounded Annually). At the time of the maturity, you will be paid an amount equivalent to the gold price as per market rate. If the gold price per gram will be Rs 3000 you will be paid Rs 16560. Alternatively if the gold price reduces to Rs 2000 at the time of maturity you will be paid Rs 11040. 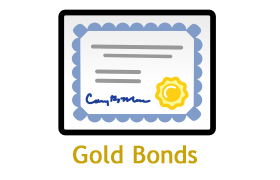 Gold Bond will give additional 2% annual returns, so instead of buying physical gold if someone purchases gold bond he will have an additional advantage of 2%. Upside gains and downside risk will be with investors. An investor needs to be aware of gold price volatility. USD/INR exchange rate and gold price variation will be a main risk factor for investment in this scheme. The Gold bond draft says that the tax treatment will be same as that of physical gold. Capital gain on maturity is taxable, however as per me government should offer up-front tax benefit under section 80 C on the purchase of these gold bonds. I think It makes sense to give tax benefit on gold bonds if government can give a tax benefit to education loan, gold is also one of the important requirement at the time of marriage of the daughter. As per me, it is a wise decision not to invest in the gold bond, instead of selecting gold bond for the investment you can invest your money in fixed deposit which will fetch return of 8-9%. If you have a requirement of gold you can use FD maturity amount to purchase equivalent gold. Do share your views about gold bond scheme in the comment section.